I am so going to try some of these the next time it snows. sorry about the transparent ones. hahaha they're all pretty good! We're supposed to get a decent amount of snow (for maryland anyway) this weekend - might have to try and do some of these. Armor: Engine Skid, Oil Pan Skid, Rad Guard, Belly pan. Future Mods: LED Light Bars, Roll Cage, Stereo, CB, 2m radio, blah blah blah. I allways when i see those. With more stupid comments? Two retards don't make a right. Recovery: flashlight and my running shoes, yeah, I'm bear bait. No doubt in my mind either. I went through withdrawl when the artist retired and stopped drawing it. I probably have a half-dozen Calvin & Hobbes books of his cartoons, they are priceless. I agree, best comic ever. It's in my top 2, right behind Bloom County. It's simply useless to argue on the interwebs. It's akin to arguing with a toddler. Doing so only makes you look silly and they always poop their pants. Recovery: Aging tow strap, Orvis tow hooks. Factory hitch. Armor: Full Orvis skid plates. Accessories: Cobra 75 WX ST, 4D MagLite, Fire Extinguisher, first aid kit. I rank Andy Capp up there, too. But Calvin reminds me of myself when I was growing up, so he hits top mark. 1997 ZJ 5.2 Orvis, Baby! Im getting tired of thinking...guess I'll do some wishful drinking. I tried to make the one on the ground pee himself, but the lemon juice didn't show up too well (should have used something more syrupy). Made the vomit with blended peas -- I've got some canned corn ready to go for a two-tone mixture if we get any snow this year. Then again I may do something different entirely, maybe something involving the lawnmower and a lot of cranberry sauce. I have the need to make a snowman now. My neighbors all ready think I am odd soo it will be okay. A big THANK YOU to AmbuGrl and Mudvain for upgrading me. Yes, I'm a girl, I drive a TJ and like to get it dirty. Yes, I like boys. Get over it. the biggest challenge will be finding appropriately shaped arm sticks. 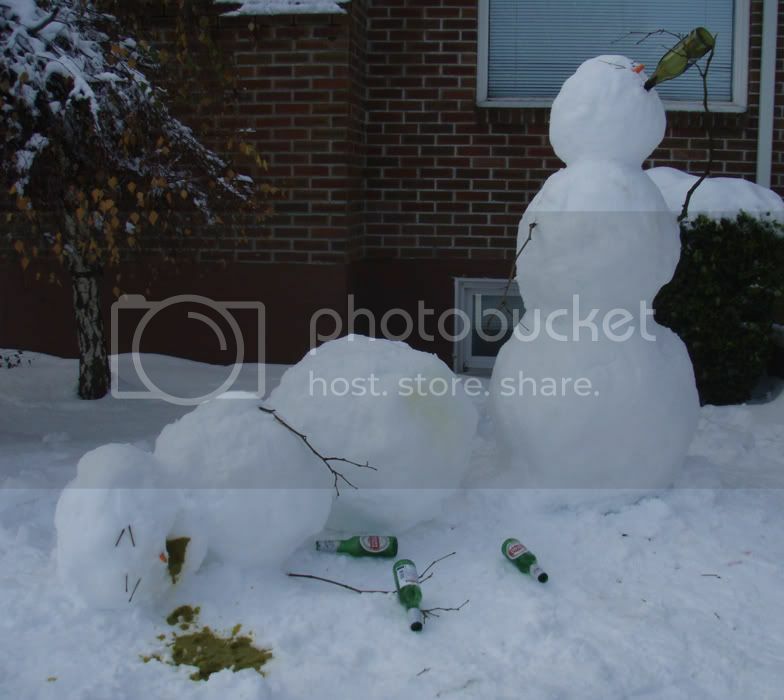 I have done the snowman being hung, the snowman burying the other, and the the one getting hit by the car. Its true it does slow down traffic. I'll see if i can find the pictures.